I’ve been participating in another fabrickated -along, this time a dress like Frida Kahlo sewalong. When I began this sewalong all I really knew about Frida was that she made the monobrow look stylish and that she had a rather gaudy bent. In other words, not much! Thanks to Kate I’ve now researched her pretty well, looked at a few books and discovered the movie “Frida” on Netflix (thanks to Sarah for alerting me to this). Kate has also done a series of posts on her clothing, and given us a little overview of the exhibition currently on at the Victoria and Albert Museum. Frida had an extraordinary life, albeit a short one, and her style was unique and still quite contemporary. Kate had us exploring the Huipil, which, according to Wikipedia is ” a loose-fitting tunic, generally made from two or three rectangular pieces of fabric which are then joined together with stitching, ribbons or fabric strips, with an opening for the head and, if the sides are sewn, openings for the arms”. Doesn’t sound too hard. Whilst this was going on, one of my lovely friends, Leonie, gave me a Mexican outfit which had been given to her and which she had never worn. Oh, be still my beating heart, could this fit any better? This is the most splendid outfit, and the colour is glorious. It’s made from pintucked cotton with cotton lace sewn in between panels. What a lot of work! The construction is rather interesting; the sleeves have a raglan top which forms part of the square neckline. It also has long darts for shaping. I’m pleased that wide-legged trousers are back in vogue because I’m going to wear this outfit to death this summer. The participants in the sewalong have all had a lot of fun finding bits and pieces to decorate our Huipils, and I finished up making several, but am only going to show two here as the post got ridiculously long. The first one was made by joining three cotton/linen tea towels together. I managed to get all the stripes aligning, and took it off to a class with Workspace Fashion & Design School, where I set about learning to block print. The new book by Jen Hewitt, “Print, Pattern, Sew” was the inspiration and I read all her suggestions carefully and then Sarah showed me a slightly different way to go about things. I wrote a blog post on this process on the Sewcialists blog, and you can check all the details of the block printing there. 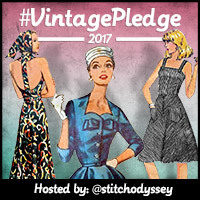 I’m going to add a little bit in case you don’t see the sewcialist post – although I’d love it if you went and looked as the August theme is Sew Style Hero, and I’ve mentioned a hero or two. In précis; I did some sketches of a selection of the flowers to be found at our holiday place and we chose one and photocopied it and coloured it in and then traced it onto some lino (actually rubbery stuff) sheeting. I then chiselled it out. Not very well! Sarah and I fiddled about with the colours and then I started printing, without any real plan at all. This photo shows the paper based version of what I am printing. It’s hard to tell that they are the same thing! I made lots of mistakes with this printing, like pressing too hard and not thinking too carefully about my pattern placement, but it was such fun. The roller is from when my son insulated the inside of his car (yes, there is such a thing!) and the insulation had to be rolled on to the metal. It is a most useful tool and I have permanently appropriated it for my sewing room. We didn’t have different stencils for the different colours, I just whacked the colour on where I felt like and let them overlap or have gaps. Each print has three different colours rolled on to various parts. I worked hard to get my stripes matching, but, because the tea towels were printed flat, I didn’t get my flowers going over the seams. You can just see the side seam on the left here. I used embroidery floss to outline each of my flowers, but it’s pretty subtle. I used another tea towel for the bias binding at the neck and I really like the contrast. I frayed the armholes, bottom edges and top edge of the pocket. The pocket was actually the cutout piece from the neck, so this is zero waste. I blanket stitched it to the Huipil. The monkey (Frida seemed to have a monkey about her person here and there) and flower crown (tutorial on how to make it here) complete the outfit. And here is the complete outfit. I made myself some Megan Nielsen Flint trousers in blue linen from Potters and was thrilled that they coordinate so well with this top. I have made a new crown. It’s a little unfinished here, but the flowers don’t require any knitting so I shall do a quick and dirty post on how to make them later this week. Since I began this post I managed to finish the crown and my wig stand is modelling it for me. I’m also trying to show my sneakers, which I felt were very Frida. I’m only including this photo because the wind was crazy and was blowing my hair all over the place – I promise I haven’t just got out of bed. This next Huipil is actually the first one I made. I used the free pattern that Kate linked to and which was provided by the V&A Museum. The fit isn’t that good on me, but it got me started. I used some hand woven and dyed fabric that I bought in Sri Lanka and used a piece of vintage curtain as a reverse facing at the top. I used the neck cut out as the decoration at the front, and a couple of pieces of coordinating braid. I attached all the decoration with chain stitches as I read that Frida’s Huipils often had decoration attached with chainstitch. I used my coverstitch machine, which meant that I had to sew from the wrong side, which is quite a tricky thing to do. Needless to say that this top doesn’t really bear close inspection, and after all that you can’t even see the chain stitches! This time I have a chicken in tow as Frida often had birds on her arms and shoulders and I couldn’t find a stuffed bird. The chicken was it! I had this little cutout work daisy that I made at school and it just begged to be attached to the top. As is my wont I have become completely obsessed with this challenge and have made some more, but as I mentioned earlier, the post just got too long, so I’m beginning with these two “proper” huipils and will write up another post with the rest later in the week. I think the Flints are the perfect combination with the huipil. I really struggled to find things to wear with them – I’ve made a few now! You are immerging in Frida‘s style, Sue! I really like the outfit with the printed towel huipil and the lovely knitted flower crown! The Flint trousers suit you so well (mine were a desaster)! Others would have to go to an expensive hairdresser to get your hair made by the wind! Oh SaSa you are so lovely! I think the Flints need to be longer, but the cropped ones would look terrible on me, so I think they are wearable. I did laugh about the hair, my hairdresser would have a fit if he saw it! You are rocking the Frida look! And isn’t printing fun? I used to get together with friends, and we would print and dye fabrics for quilting, but now I am getting inspired to try it again, in a simpler form, for garment fabrics. Why should kids have all the crayons and finger paints? I can’t believe how much I enjoyed the printing, and am definitely going to do a lot more of it. I’ve also recently done a little bit of fabric painting and loved that too. Agree re kids having all the fun! Oh what fun projects! I should really start trying to print on fabric, your result looks lovely! The outfit turned out really ‘Frida’ and beautiful. I think that fabric printing would be a very logical next step for you – you will make it your own! Oh how I’ve enjoyed living vicariously through your creative endeavors in this challenge!!! You look like you are having such fun and it is contagious!! Adore your printed huipil and how you incorporated so many different techniques in one simple top. I really like the 2nd huipil too with the added textiles. Interesting in that Frida completely monopolized me and my work until I finally completed and had closure with my outfit and final post. Can’t wait to see what you make next Sue!! 🙂 P.S. And the blue outfit is a flattering fit and stunning color. Hard to believe it wasn’t custom made just for you!